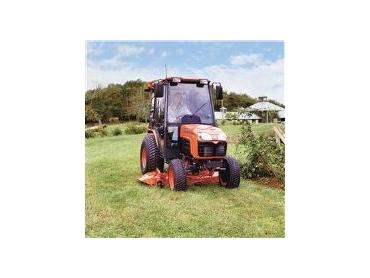 Kubota Australia has released a new range of compact tractors to the Australian market. The new B30 series tractors with their streamlined new body style, enhanced functions and superb performance feature hydrostatic power steering, increased 3 point linkage lift capacity and multi reflective headlights. The new range Comprises the B2630 (26 hp) ROPS model and the B3030 (30hp) ROPS and CAB models. Being the first cab model in its class, the B3030HDC provides an incomparable level of comfort. The efficient air conditioning lets operators work all-year round in comfort whatever the weather conditions. The cabin is well sealed and has excellent all round vision. A parallel link suspension seat, tilt steering wheel, radio / CD player are standard equipment as well as a front wiper / washer, front work lights and external rear view mirrors. Rear work lights and rear window wiper are optional. The operator platform layout for both the ROPS and Cab models are identical and provide both convenience and comfort. A tilt steering wheel combined with an adjustable high back seat allows operators to choose the optimum driving position. A white background on the easy-to-read dash panel enables operators to monitor tractor functions such as engine speed, engine temperature and fuel level. Fender mounted control levers are within easy reach and angled towards the operator for easy identification. Functions of these levers include PTO engagement, cruise control, three point linkage raise and lower and transmission range selection. For increased efficiency, Kubota has fitted a new three range hydrostatic transmission to all B30 series tractors. The increased efficiency of this more powerful transmission makes for easier operation. A wider foot pedal makes direction and speed changes easy especially when combined with the cruise control. The three-point linkage has also been boosted. Lift capacity is 970 kg on both models. Telescopic ball ends, telescopic stabilizers and a ratchet type-levelling rod all make for easy attaching and detaching of implements. B30 series tractors also have remote hydraulic valves available as an option. Customers have a choice of two side discharge mid mounted mowers – 60 inch or 72 inch type for the ROPS model while the CAB model does not suit the 72 inch unit. These mowers are quickly attached or detached from the tractor and are compatible with the performance matched quick detach/attach LA403 front end loader. The LA403 front-end loader is designed to match the B30 series and has features such as brace-less frame construction, in built hydraulic hosing, simultaneous single lever operation via a fender mounted control valve. With so many premium features standard on the B30 series tractors, customers would expect to pay a premium price, however with prices for starting at $24,530 including GST for the ROPS B3030, the new B30 series are amazing value for money.